Tampa, FL– The Ybor City Museum Society (YCMS) is proud to announce the recipients of the 2018 Legacy Awards, who were selected for their significant contributions to the Historic District. 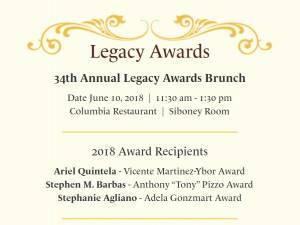 Ariel Quintela (Vicente Martinez-Ybor Award), Stephen M. Barbas (Anthony “Tony” Pizzo Award), and Stephanie Agliano (Adela Gonzmart Award) will be honored at an Ybor-style brunch at the Columbia Restaurant on Sunday, June 10, 2018, 11:30 a.m. -1:30 p.m. Reservations can be made at YborMuseum.org/Legacy-Awards. Now in its 34th year, the Legacy Awards celebrate the achievements of visionaries who have made a lasting economic or cultural impact on Ybor City, Tampa’s National Historic Landmark District. All proceeds benefit the Ybor City Museum Society, a 501(c)(3) nonprofit organization whose mission is preserving, promoting and celebrating the unique cultural heritage of Ybor City and supporting the Ybor City Museum State Park.